Celebrations are a large part of people’s lives. Many people commemorate key moments – from birthdays to anniversaries to graduations – with parties. While celebrations may seem like a fine idea, there’s no denying that throwing a party where everyone has fun requires a lot of work. When planning a party, hosts must consider a number of factors, including their budgets. While guests are a key ingredient to fun, successful parties, hosts can take the following steps to further increase their chances of throwing a bash to remember. · Start planning early. A party-planning checklist can help hosts stay organized and ensure that even the smallest detail isn’t forgotten. Writing ideas down on paper and having a tangible checklist can make it much easier to organize a party. · Pick a theme for cohesion. Party themes need not include something over the top, such as costumes. The right theme can be as simple as choosing a color scheme or uniting element that connects all of the components of the party. Once you have a theme in mind, you can start compiling all of the details and supplies, which can make shopping easier and more efficient. · Create a festive atmosphere. Think about the ways you can enliven the atmosphere to make it more inviting for guests. Appeal to guests’ senses by employing lighting, sound and scents. One easy way to set the tone for the party is to have a well-thought-out playlist that’s timed to coordinate with the elements of your party. 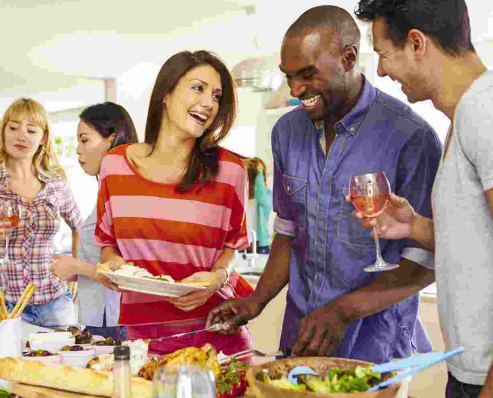 Keep music low at the start of the party and during the meal to facilitate conversation. As the party progresses, increase the volume of the music and select music with an upbeat tempo. · Create a guest book. Give guests the opportunity to share their sentiments no matter the event. Place a guest book where guests can easily see it, and encourage them to jot down a few words for the guest(s) of honor. This can serve as a nice memento in the years to come. · Offer a self-serve bar. A self-serve bar cuts down on the work hosts must do. Be sure to keep an eye on guests’ alcohol consumption, and have a plan in place to help guests who might overindulge. Keep the contact information for local taxi companies handy just in case a guest needs a ride home.